We received an e-mail from RagingBully, sending in a photo that reveals new character reference photos from the upcoming Star Wars Episode VII: The Force Awakens. 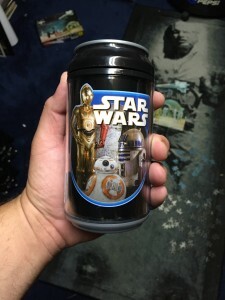 The item is a Mexican Force Awakens Hot & Cold Beverage Container. On it is a clear image of new droid BB-8, as well as classic droids C-3PO and R2-D2. C-3PO is clearly shown having a new brownish-red arm (similar to the color of the Battle Droids in Attack of the Clones). Click the image for a full resolution shot, and thanks to Raging Bully for the information!